InertSustainSwift C8 is an octyl group (C8) bonded column offering the same extreme inertness to any type of compounds just like InertSustainSwift C18, which is ideal for analyzing low polarity analytes. In addition, the optimized 200Å pore size silica enables to analyze and retain peptides and oligonucleotides which have a molecular weight from several kDa to several dozen kDa. 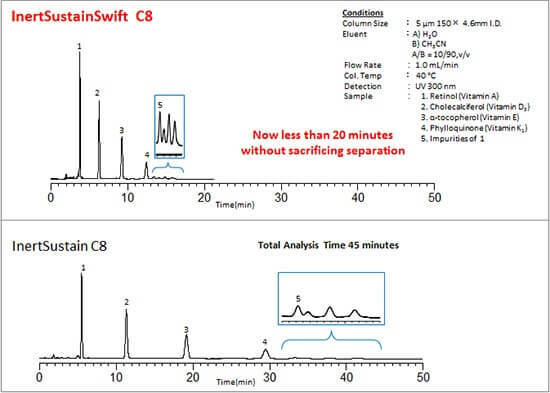 InertSustainSwift C8 offer rapid elution of samples and ideal to make samples or impurities to elute rapidly when observing them not to be eluted fast enough even under organic solvent rich mobile phases.